Home » What is TOR? TOR is an interesting addition to your set of privacy tools. Learn about what it is, how it works and how it can help you stay hidden. TOR, short for The Onion Router, was initially developed by the U.S. Navy as a means to facilitate anonymous internet browsing by using a worldwide network of servers. Today, TOR is run as a non-profit company whose main objective is the research and development of online privacy tools. The TOR network helps to hide your identity by moving your traffic across the many different TOR servers (“nodes”) on its network and encrypt this traffic so that it cannot be traced back to you. If any person or organization were to try and trace your TOR traffic back to you, all they would see are random nodes from within the TOR network rather than your computer. Today, TOR is used by a vast range of people for several different reasons. Usage of TOR isn’t only restricted to private individuals – government organizations, police, journalists, whistleblowers and high-profile people all use TOR for their day-to-day browsing. Imagine that you want to be anonymous because – say, because you live in a country run by a dictator or you are a journalist currently working within an oppressive country, or you are a hacker who wants to stay hidden from the government – then TOR is by far one of the easiest ways to protect yourself when browsing the internet. Although it’s great for people with an agenda or something to hide, it is also infinitely useful for any normal person who just wants to keep their internet activities away from the prying eyes of companies, ISPs, advertisers and other websites. If you don’t want your browsing habits linked to you for whatever reason, then you should be using TOR. Although it is far from being perfect, it is completely free. And by being aware of how to use TOR properly, you won’t ever run into any problems. What is an Onion Browser? An “Onion Browser” on Windows, Mac or Linux is simply another term for the TOR browser. Using TOR’s browser gives you access to special .onion websites which are only available through the TOR network. 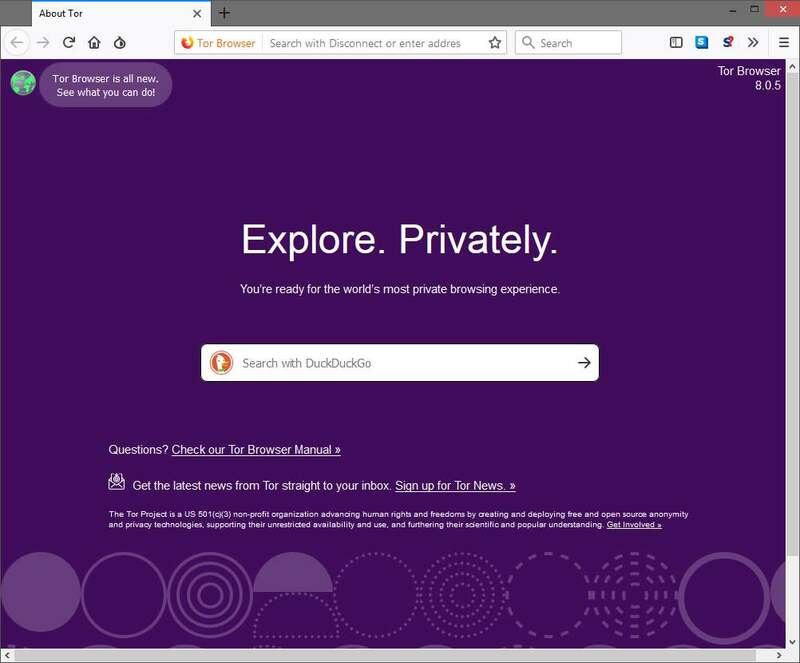 Although you can only access .onion websites through TOR, you can still access regular websites on the “surface web” by using the TOR browser. .onion is a special top-level domain suffix which denotes a service which is hidden and only reachable by accessing the TOR network. The collective term for .onion websites is “the dark web” because these .onion sites cannot be accessed using a normal browser such as Google Chrome or Mozilla Firefox. In other words, websites ending in .onion are not reachable by normal means and is accessible only through the TOR network. On iOS devices, the Onion Browser can be found under a free app called Onion Browser which can be downloaded from the App Store or from the official website. On Android devices, the Onion browser is called Orbot it can be downloaded from Google Play or from the official website. These are specially-made Onion browsers for smartphones and work in similar ways as TOR on desktop. What Exactly is the TOR Network? The TOR network is a global network of servers. These servers work together to provide impenetrable layers of privacy, thus making it more difficult for third-parties to monitor and track your online activities. Doing this, the TOR network merges your traffic together with that of other TOR users, so as more and more people use it then it gets much harder for your traffic to be traced as this “twisty” route gets a lot more entangled. Using multiple layers of encryption – hence the name “The Onion Router”, because an onion has multiple layers – it is relayed through a series of nodes. Each time data hits a relay, one layer of encryption is removed so that each relay node can determine where your data should be sent next. Doing this, your data’s path can’t be determined with ease. And this process makes it difficult to figure out which websites a person is visiting. TOR is a great tool, but it is far from being perfect. Just because you are using TOR does not mean that you are 100% anonymous and free from prying eyes. Even though your browsing cannot be spied on, agencies such as the NSA or your ISP can see that you are using a TOR browser, and this makes you a higher target. With enough work put into you, government agencies can figure out who you are and what you might be doing. It is important to remember that anonymity is not the same as security. Sure, it is hard for the TOR network to be hacked into, however, it’s a different story when it comes to the TOR browser. In case of you having a trojan virus, a third-party can see everything that is going on regardless of whether you’re using TOR or not. If a third-party can access your data before it’s encrypted & routed through the Onion network, they can see everything that is going on. One of the ways this could happen is by a “man in the middle” attack, and this is done, for example, with the cooperation of a user’s ISP. The mere use of TOR is not enough to fully secure you. Large-scale surveillance by government agencies, browser bugs and exploits, and general security on the user-end are all potential security flaws. You can protect yourself from these “man in the middle” attacks and browser exploits by using HTTPS whenever you can, too. Whilst TOR isn’t a 100% foolproof solution on its own, it can be when used in conjunction with a VPN – more on this later – and security agencies are not going to start targeting every user of TOR with browser exploits. If they did, people would certainly notice; this would discredit agencies such as the NSA, and they are well aware of this. TOR is, to an extent, untraceable and anonymous, however, this can be further improved by using a VPN. When you use the TOR browser in conjunction with a VPN, you are making it 99.9% safe, secure and anonymous. This is what the TOR browser looks like in 2019. They recommend you change the browser size around so people can’t keep track of your resolution! TOR itself is not a VPN. The nature of TOR and VPNs are entirely different things, but they can be used together – this is always recommended – to provide a completely safe, secure, untraceable and anonymous internet browsing environment. By routing your VPN traffic through TOR there are major benefits. However there are disadvantages as well and if you don’t do it properly, then it can be quite dangerous. You can either route your traffic from your VPN to TOR or from TOR through your VPN. We recommend researching on this topic and decide on which option suits your risk appetite. By routing your traffic from TOR to VPN then you have the added benefit of traffic being hidden from malicious TOR exit nodes. By using this configuration, your web traffic is encrypted when it enters the TOR network by your VPN and is then decrypted by your VPN when it leaves, so any compromised exit nodes which are looking at your traffic won’t be able to see anything. One could argue that TOR over VPN is better for security. By routing your traffic from VPN to TOR, you are protected by the VPN service and your IP is hidden from your ISP. By using this configuration, however, leaves you more vulnerable to attacks such as end-to-end timing attacks. One could argue that VPN over TOR is better for anonymity. There are several VPNs which do a fantastic job when coupled with TOR browser. By using any of these three VPN solutions alongside the TOR browser, you can be safe in the knowledge that, when properly configured, all your traffic is safe from third-parties. Your data, identity and browsing habits will be protected. Panama-based NordVPN provides its users with access to pre-configured servers specially designed for TOR over VPN use. This eliminates the need for the end-user to configure anything and you can dive straight into TOR when it’s installed. NordVPN also has a zero-logging policy and top-level encryption for further security, plus it has apps available for iOS and Android. With a dedicated .onion version of its website, ExpressVPN is a great VPN solution for TOR browsing. It’s got a zero-logging policy and you can use BTC to pay for it. In terms of speed, it is slightly faster than NordVPN. It uses industry-leading encryption and can be used with the TOR network out of the box. Whilst AirVPN is not super-fast or as intuitive as Express and NordVPN, it has VPN over TOR built into its apps. It first routes traffic through TOR, like we discussed above, then through the VPN so it is double-encrypted before it leaves your device. It also has no logging and accepts BTC. If you are looking for a robust VPN to use with the TOR network, these three are stellar choices along with the rest listed on the best VPNs page. Is TOR Safe? Should I Use It? When used properly and in conjunction with a VPN, TOR is a completely safe, secure and anonymous browser. If you want to hide your browsing habits from third-parties for whatever reason, it’s the only thing you can use to ensure your privacy. While you can use TOR without a VPN, it is simply not as secure. TOR works right out of the box with no configuration required, and if you use one of the above-suggested VPNs alongside TOR then you won’t have to configure your VPN for TOR use, either.